Will bike for virtual trophies. The thought occurred to me as as I biked up the Capital Crescent Trail to Bethesda. Ordinarily, I’d ride up to Bethesda, look at some books at Barnes and Noble, then turn around and fly back down the trail to DC. But Strava was in the back of the mind. The fitness social network has occupied an increasing chunk of it this year. I even purchased a premier membership to better track my rides and runs. 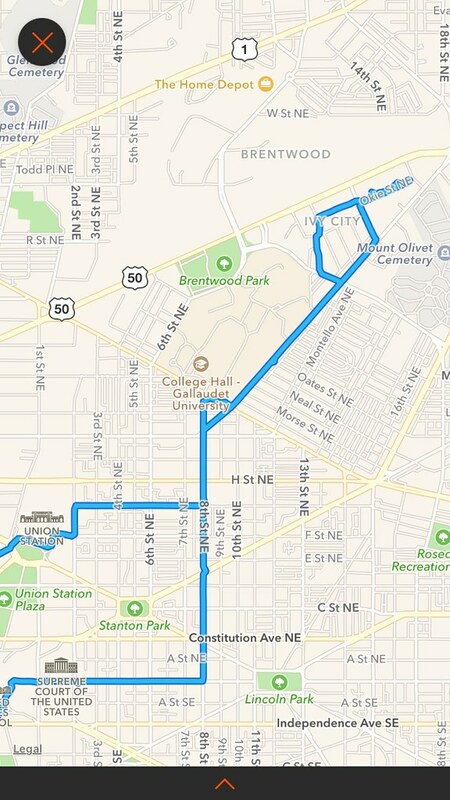 I couldn’t just bike to Bethesda – I was being tracked! I had to put more miles in, especially after I saw some of my Strava friends off on a hundred-mile ride to Sugarloaf Mountain. What would they think of my little jaunt to the book store? Nice people, Mary and Ed. But following them on Strava will make you feel like a slacker. It was a lovely day anyway. I didn’t even stop in Bethesda but followed the Capital Crescent Trail until it connected with Rock Creek Park. Then I took that back home, racking up 26 miles and 22 different Strava medals, lol. Strava is more generous than a helicopter mom handing out post-soccer treats. Stopping the Strava for a selfie in Rock Creek Park. I once scoffed at the ride-tracking service, thinking it was only for MAMILs. I’m a slow-cyclist, more apt to bike a couple miles for coffee then do a century with a pack of lycra-clad men (yuck). But then Strava started giving me more trophies than a Millennial spelling bee, awarding me Personal Records, Second and Third Place medals for biking tiny little segments of DC. Even though it was absurd, I felt honored to achieve a new record for biking a .7 mile segment of 15th St, giving me the self-esteem of a selfie-obsessed teen as she passes the thousand-follower mark on Instagram. We respond best to rewards, even virtual ones, a topic that Jane McGonigal explores in SuperBetter. I saw her speak at SXSW ten years ago. Her message stuck with me because she changed my mind about online gaming. McGonigal extolled the virtues of gaming and the reasons for their appeal. Unlike life, games have fixed rules and rewards. It’s no surprise that people find more meaning in games than our chaotic and uncertain world. Lessons learned from games are now being applied to real-world challenges. It’s called the gamification of life. From the Apple Watch to Pokemon Go, gamification encourages us to be our best selves. This is bewildering for a GenXer. We never got trophies! Unless, you won, of course. But, now, with apps like Strava, I can win scores of trophies, like the only child of suburban parents in Montessori school. Game on, Strava, game on! I’m a Brand Ambassador for Enterprise CarShare. In return for sharing my photos, I get three free trips from the carsharing service. For my first trip, I went on a lovely loop around western Maryland, including a stop in Shepherdstown. For my second trip, I returned to Maryland but this time went north, to Monkton, and the Northern Central Railroad Trail (NCR). Loading up my Specialized Sirrus in the back of a Nissan Rogue, I got an early start on a very steamy Sunday. A couple hours later, I was in Monkton Station, the most scenic starting point on the trail – and the most crowded. Parking restrictions meant that I had to park a couple blocks away, on a side street. But I had a bike so it didn’t matter to me. I rolled over the bridge and onto the trail. Monkton Station on the NCR Trail is a popular spot for biking, hiking and tubing. And into the mud. Epic rains had hit the night before, flooding the nearby town of Ellicott City. The trail had some big puddles and some muddy patches to traverse. There was even a tree down. My Specialized Sirrus is an older model with skinny tires. It got wobbly at times passing through the mud. NCR Trail has a crushed stone surface with some muddy patches. The trail follows the Gunpowder River upstream. It’s an incline that I only noticed by the amount I was sweating. Trail amenities (like water) are sparse once you get north of Monkton. It’s a pleasant ride through the woods with a river for company. Lots of runners on the trail, utilizing several access points along the NCR. A dozen miles in, and I was about out of water. But, by then, I was really close to the Mason-Dixon Line, so I kept going for the photo-op. Pretty cool to pass over the line and then cross into another state. Made it to the Mason-Dixon! At the Pennsylvania border, the trail becomes the York Heritage Trail as it rolls into New Freedom. What a cute trail town! Reminded me of the towns along the WO&D except this one had a real steam engine plying the rails. I had lunch and waited for my friend Bob, who started later, and caught up with me at the trailside cafe in town. A working steam train in New Freedom. I did not visit the Party Caboose. On the way back, most of the mud had dried, so we flew downhill. Bob exited at Parkton, which had a very cool stone bridge and a former bank that had been turned into a private residence. There was a slight uphill portion getting back to Monkton. I passed people carrying tubes along the trail. They put in the river upstream and float down to Monkton. It was a long walk for them – at least a mile. After hours in the muggy heat, I was ready to get home. Carrying tubes upstream at Monkton. In the morning, there had just been a couple cars on the side street where I parked. When I returned in the afternoon, cars were everywhere and there was a tow truck on the street. Time to leave. My bike was covered in soft sand and mud. I put it in the back of the Rogue and took off. The NCR Trail is a beautiful woodsy trail – but the Heritage Trail in Pennsylvania looks even nicer. I hear there’s ice cream along the trail, too. That’s my kind of bike ride. Looking forward to going back to New Freedom and riding it north to York. If you live in Northwest DC, vast sections of the city exist only as vague and mysterious notions, sort of like that infamous view of the world from New York poster. Of the other quadrants of the city, you know Southeast as Capitol Hill, Southwest as the place with the brutalist architecture and Northeast… what the hell is in Northeast? But it’s a big city, bigger than you imagined, sprawling north and east into neighborhoods that look like suburbia and others that look like Newark. On a bike, you have a chance to look around in a way that you can’t on a car. It was by bike that I first encountered Ivy City, during last year’s Plaid Ride, sponsored by BicycleSpace. Cyclists dressed in plaid biked down 18th Street, then east across the city on K, before a gentle incline on West Virginia Avenue past Gallaudet University. When we got to Ivy City, it was an industrial zone of razor-wire fences and and buildings that were being repurposed. 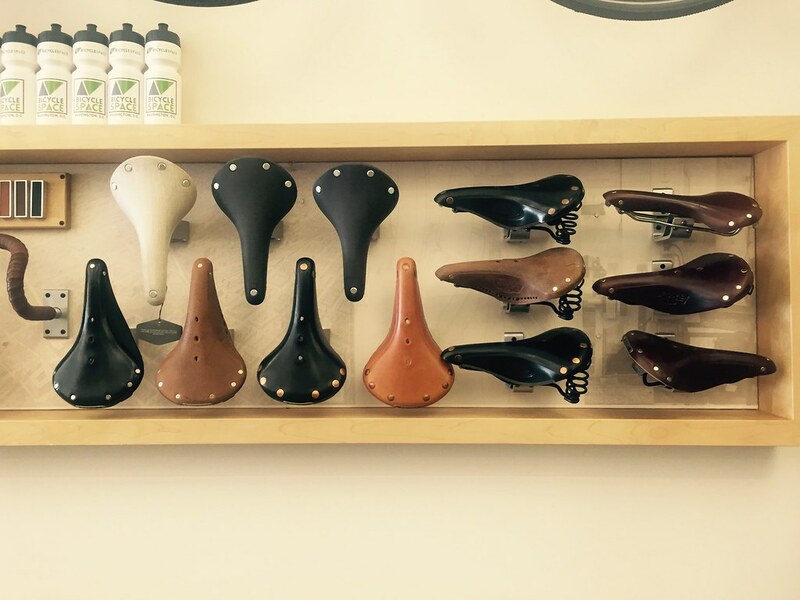 BicycleSpace wanted us to see where their new space was going to be. I recognized the old Hecht’s Warehouse and my mental map of the city reoriented itself – we’re off New York Avenue, I realized. 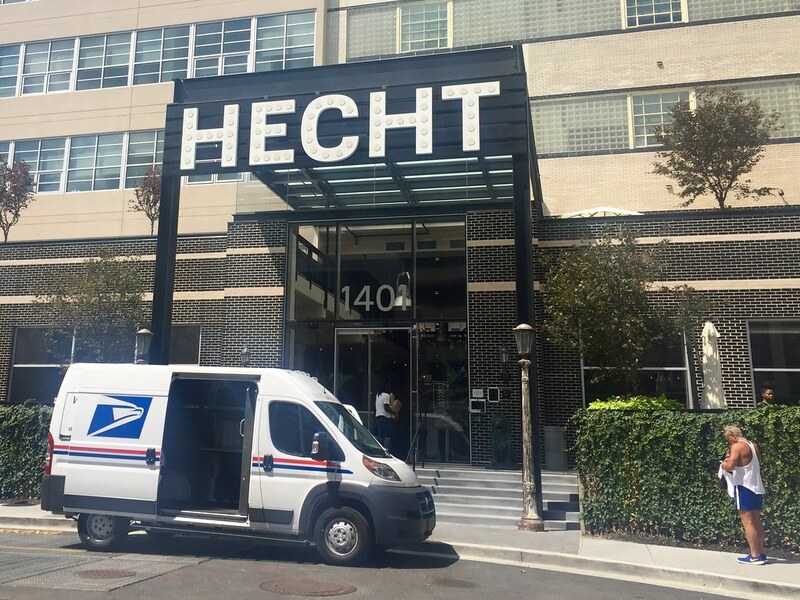 The Hecht’s building is a landmark if you’re driving on New York Av. Ivy City is being redeveloped. According to the Washington Post, it’s the next cool neighborhood you haven’t heard of. 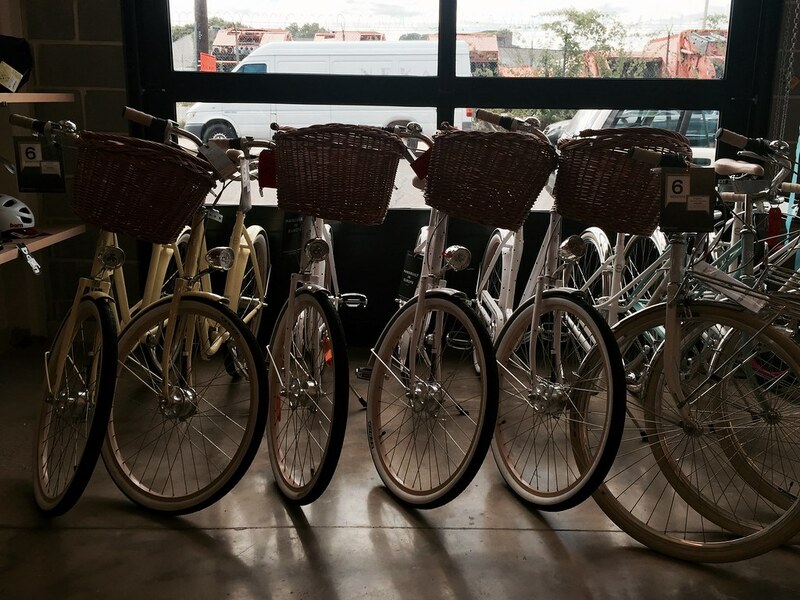 This pocket-sized industrial district is now home to a brewery, a gin distillery and hot yoga. You can also pay a fortune for a loft in the old Hecht’s building too. 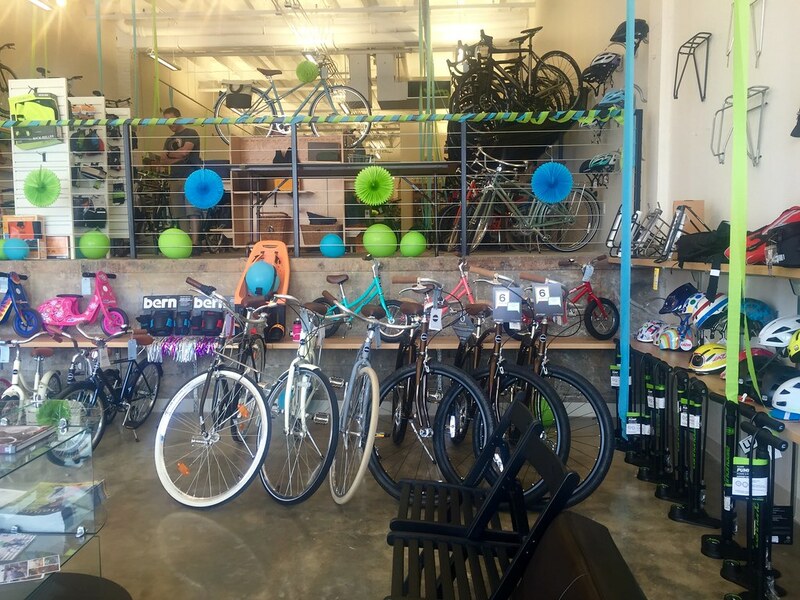 It’s also home to a new BicycleSpace store. I biked into Northeast to check it out and Ivy City. I was also tempted by bike deals. They had a Jamis Commuter on sale which was sadly gone by the time I got there. No major loss – my Specialized Sirrus is really similar to the Jamis, even if it isn’t as cute. I ogled the Bromptons, as I do, lusting after these British folding bikes, but then was massively distracted by the Salsa Marrakesh. Such a solidly-built bike, it looks like it could survive the apocalypse. If I ever drop out of society, and travel the world on two wheels, I will do it on one of these bikes. Ivy City may be the next cool neighborhood but it’s still the end of the line to me. Not near the Metro, and hemmed in by busy New York Av, I don’t get the attraction – there’s a lot of concrete and not many trees. And paying Logan Circle prices to live there? Doesn’t make sense to me but DC real estate left the territory of rational explanation a long time ago. At BicycleSpace, I bought socks. Figured I had come this far, may as well get something. Then I headed back downtown, where I could get lunch and coffee. It was one of those perfect Sundays in April that forced you outside. Tulips were blooming, the skies were cloud-free and the temperature was inching toward 60 degrees. No way was I staying inside. I wanted the WO&D Trail, an old rail route that runs for 45 miles and escapes the DC metro sprawl. The furthest I’ve biked on the trail was Vienna. This time, I would go further. And with my Specialized Sirrus tuned up by Bike Rack, I had the perfect vehicle to get me there. 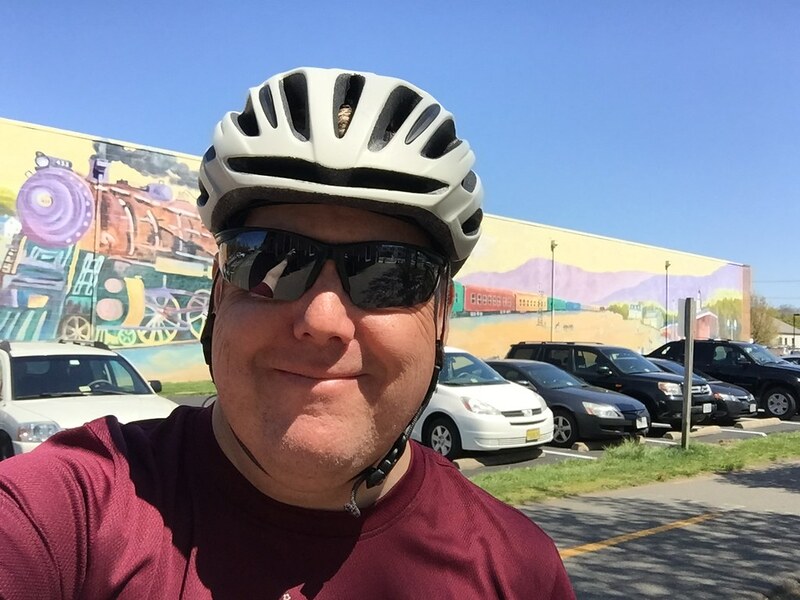 So I biked and biked and biked – up the long hill in Rosslyn, around the fun corkscrew on the Custis Trail, and then the ascent into Arlington, Falls Church and Vienna. Then I kept on to Reston, where I had lunch in their ersatz town center, and turned around. Strangely, for me, I hardly took any pictures. I was focused on riding. 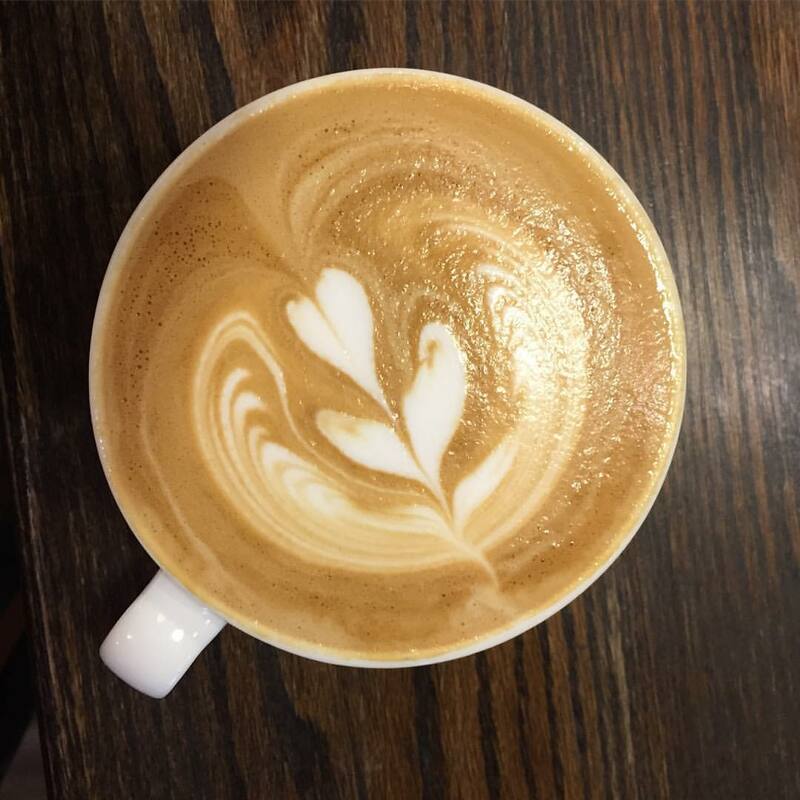 On the return leg, I started to flag near Vienna so I stopped for cappuccino at Caffe Amouri. The great thing about the WO&D is that every few miles there are breweries, restaurants, bike shops and coffee places. The caffeine was enough to push me back down the trail, where I got to fly downhill on the Custis Trail and back to DC. I returned exhausted, a little sunburned and strangely un-hungry. I’m not that much of a Strava fanatic (it’s a fitness-tracking app) but I’m embedding this ride because 50 miles – that’s a record for me! Author Joe FloodPosted on April 19, 2016 April 19, 2016 Categories ravesTags bike, bikedc, reston, strava, va, vienna, virginiaLeave a comment on Let’s Ride to Reston! Muy macho in black, this electric bike is perfect for the city. I had the chance to do a test ride on a Riide electric bike. Billed as “e-bikes for urban commuters,” this DC company has made the nicest-looking electric bike I’ve ever seen. 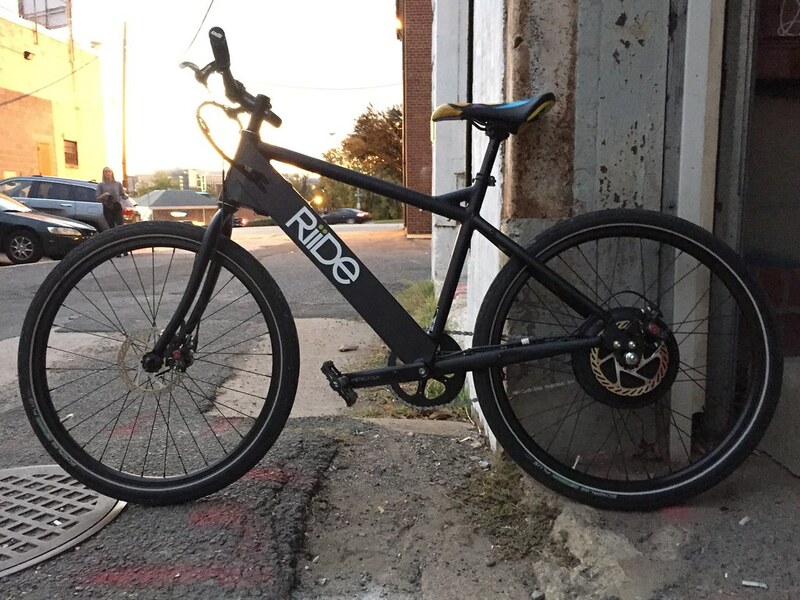 I own two bikes already – a Specialized Sirrus and a Breezer folding bike – but I really wanted to try a Riide. Perfectly targeted for everyday cyclists like myself, it’s the first electric bike I could see myself owning. But what is it like to ride one? First, it’s a beautiful bike, with a black matte paint job that makes it the coolest thing on the road. What surprised me was the weight – it’s lighter than I imagined. Billed at 40 pounds, it seems lighter. It’s not a road bike, but it weighs less than a Capital Bikeshare bike. The narrow top tube makes it easy to pick up and carry. Missing: a kickstand. It’s a little big and awkward to lean against stuff. Running errands around town on one of these, I’d want a kickstand. With a flat bar and an upright position, the geometry is very similar to my hybrid Sirrus. It makes a comfortable ride and is ideal for city riding, where you want to see what’s ahead of you. Note the power button at top – I didn’t. Also, check out those massive tires. The Riide folks are super-nice. For the test ride, they just gave me a bike and told me to take off. I started pedaling. The group I was with disappeared into the distance. Why is my bike so slow? I went all the way around Union Market before discovering what I had done wrong: I didn’t turn it on! Am I an idiot or is the user always right? I prefer the latter explanation. Electric bikes work better with electricity. But my mishap taught me that it’s certainly possible to pedal a Riide around without power. With one-speed and flat pedals, it felt like I was on a CaBi. Electric motor on the rear wheel. With the bike powered up, I took off again around Union Market. It’s got a throttle like a moped. Twist and go. It was a blast to feel the g-forces as the bike zipped up to 20 mph. Amazing to go up hills on it, without even pedaling. Super-grippy disc brakes give you enormous confidence in every situation. But let me rave about the tires! Riding around on my Sirrus, I feel everyone of DC’s one-million potholes. I scan the road ahead of me for ruts, gravel and holes. But with a pair of fat Schwalbe Energizer Plus tires, the Riide just goes everything, like you’re riding on a carpet of air. 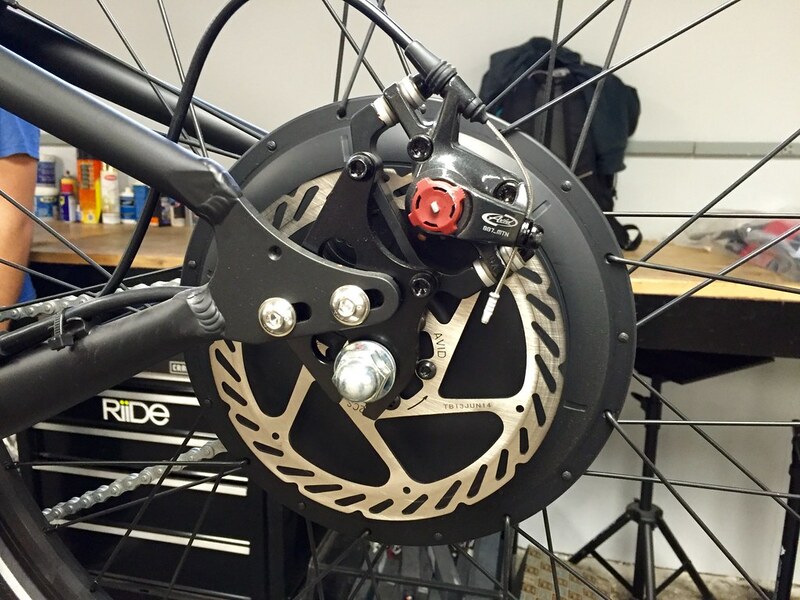 Disc brakes to quickly stop. I keep comparing the Riide to a CaBi because I think this is the perfect bike for CaBi users who want more. 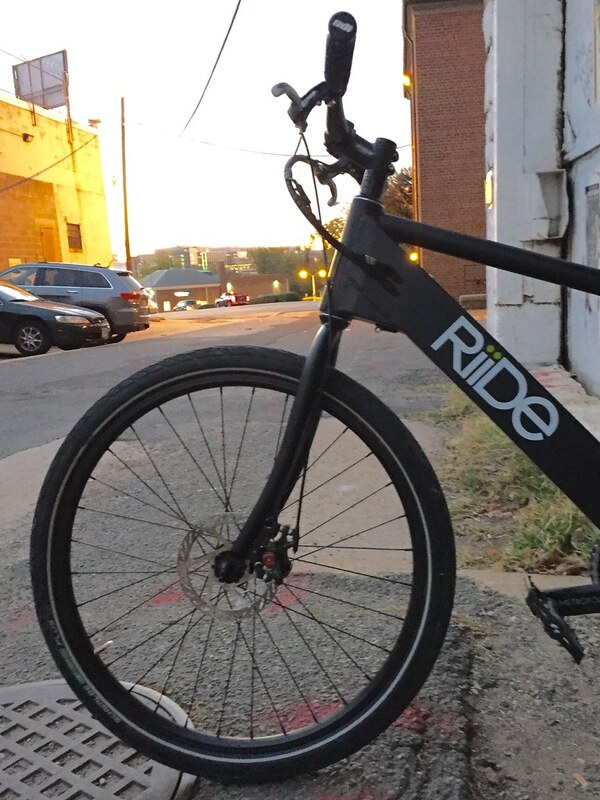 With a range of 25 miles, it’s ideal for people who want a sweat-free commute or who want to bop around town on the weekends. 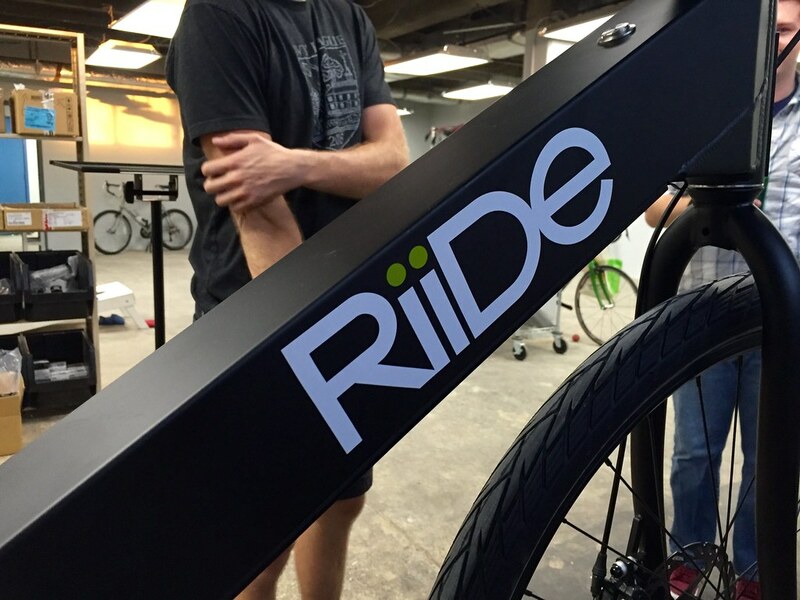 Riide is the bike for people who find everyday biking too difficult/complicated/sweaty. The RiidePass program, where you can lease one for $79 a month, is perfectly aligned for that audience. Just ride and let Riide take care of the bike. It will replace Metro/CaBi/Uber for a lot of people who live in DC or the close suburbs. It will save them money and be way more fun than being stuck on a Metro train. But would I get one? If I had to continue commuting to Silver Spring – definitely. It would be perfect for climbing the hills between Logan Circle and my contractor gig at NOAA. But I want to return to DC, where my non-electric bikes will be more than sufficient. Everyone has a different transportation situation; for a lot of people, the Riide will be perfect. I definitely want some Schwalbe tires, though. That makes a huge difference in city riding. Ride a total of at least 40 miles. You have from May 1, 2014 through June 10th, 2014 to complete this challenge. Like the equally whimsical coffeeneuring challenge, the aim of Brewvet is to turn cycling into a fun adventure. Four-dollar beer. 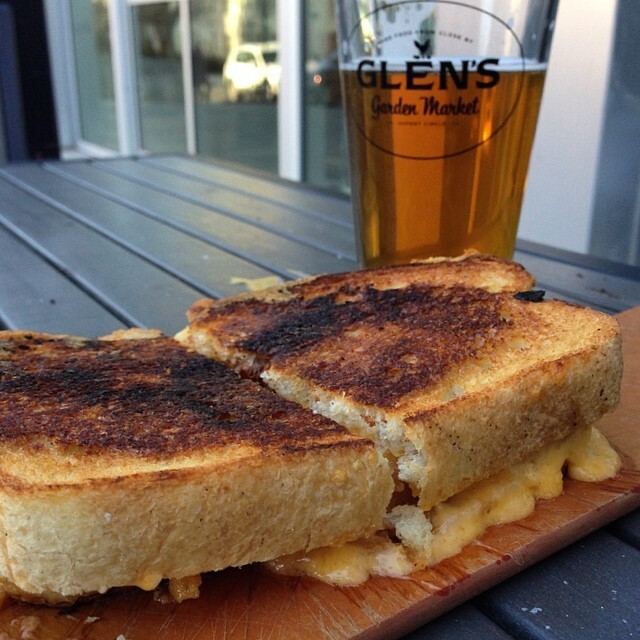 And not just any beer, but amazing local beer on draft, including DC Brau, Port City and 3 Stars, all of which you you can enjoy with a grilled cheese on their outdoor patio. Located north of Dupont Circle, you can also pick up organic snacks and sandwiches in the market. They also fill up growlers if you want to take beer with you. I really love this place. Afterward, I suggest a stop at Dolcezza Gelato to round out your urban adventure. How to get there: If you’re coming from Virginia, get to the White House then take the 15th Street Cycletrack north and make a left at R Street. Maryland riders should get off Rock Creek Parkway at P Street. Saturday afternoons are the ideal time to visit this popular Logan Circle bar. It’s usually not crowded (especially around lunchtime) and their beer selection is the best in the city. I usually get anything by Bell’s Brewery. Also, they have four-ounce pours and low-alcohol beers if you’re concerned about biking while drunk. If you have friends without bikes, there’s even a Capital Bikeshare stand across the street. How to get there: ChurchKey is at 14th and Rhode Island, a block from the 15th Street Cycletrack. 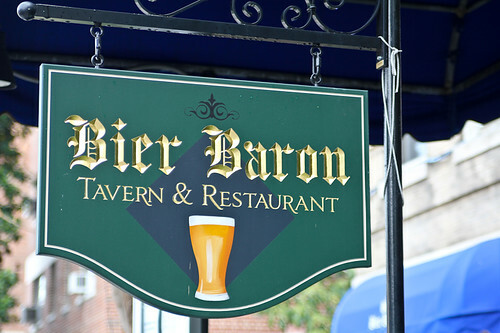 The Bier Baron doesn’t open until three on weekends and the food is mediocre. But, they have a great beer selection from all over the world, a comfy vibe and it’s just a block from Rock Creek Parkway. 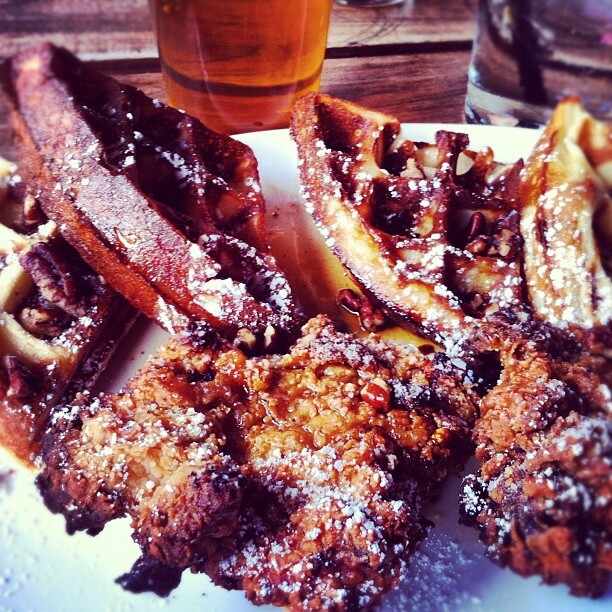 This makes it a perfect Brewvet destination, especially if you’re coming from MD. How to get there: Get off Rock Creek Park at P Street, make a left and it’s on your left. Those are my suggestions for DC – what are yours? Where should I brewvet to in MD and VA? Who wouldn’t want to parade around DC on bikes and then drink Fat Tire? Well, maybe not cycle-hating Dorothy Rabinowitz, lest her wig get disturbed, but every other normal human loves biking and drinking beer. And we had a great Saturday to do it at the annual Tour de Fat.